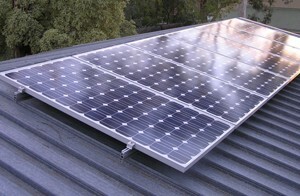 For home solar arrays, we generally recommend mounting solar panels at the top of a sturdy pole. This is called a pole top mount. They are easy to install. They keep the panels off the ground and out of harm’s way but are easy to adjust and to reach for snow removal. Yes, when the snow stops falling and the sun comes back out, you want to be able to sweep the snow off those panels. So think about where you place them, how far they are from the house, and how high up they are. A pole top mount can be either fixed, which means it holds the panel stationary, or it can move, or track, with the sun. 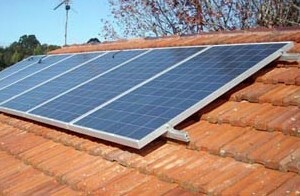 A solar panel mount that allows the panel to move with the sun is called a tracker. Fixed Racks can include Ground Mounting, Roof Mounting, Pole-Side Mounting, Boat/RV Mounts, as well as Pole Top Mounting. All trackers are mounted on poles, and so are technically pole top mounts. The pole of a pole top mount must be anchored in the ground by digging a hole and filling it with concrete. The size of hole in diameter is usually 18 inches to 2 feet (18 inches plus the diameter of the pole). The depth of the hole must be 1/2 of the height of the pole above ground. If the pole will be 7 feet above ground, you have to dig a 3 1/2 foot hole. Pitch Roof mounting look neat, but are hard to reach to adjust the angle. Will you want to walk across your roof several times a year to adjust the angle? Does it snow often? Will you have to walk across a slippery roof to sweep snow off the panels? 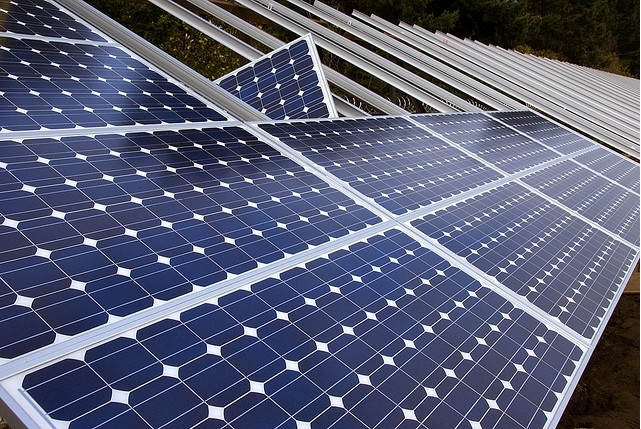 Is the slope of the roof you want to use good for optimum solar panel efficiency or will you need tilt legs to face your panels more perpendicular to the sun? Pole Mounting are designed to hold 1 to 4 modules and are mounted to the pole with either hose clamps or U-bolts (not provided). The racks accommodate different sized poles and are adjustable for optimal sun angle from 15 to 65 degrees in 10-degree increments. Pole size is determined by the number of modules to be mounted. Ground Mounting are probably the easiest way to mount solar panels. This mount resembles an A-frame. It safest to attach this structure to a cement slab so that it may be secured in place. 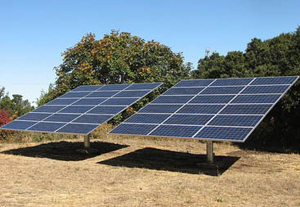 Ground mounts are designed to handle from 1 to 8 solar modules. Ground mounts can be used to attach solar panels to the ground, to a roof and or to a vertical surface. Some ground mounts have tiltable, or adjustable legs; others are fixed. Optional adjustable tilt legs are available for several of the styles of panels Wholesale Solar sells. 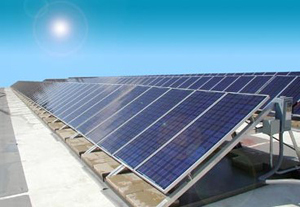 Rooftop solar mounting system apply for all kinds of pitch roof of any building. Solar panel can fastened onto the top flute of our patented solar mounting rail. L-feet connects with the bottom of the rail, which mounted firmly to the roof. Install flashing over a layer of shingles to insure water resistance. A single wrench is enough for the installation procedures. Detailed installation manual ensure an easy and smooth installation. 1.We use L-feet for tin roof and hook for tile-roof to connect the rack structure with the rafters of the roof. 2.At the installation site we do not require welding, and even have no need to drill a hole, just using the electrical locks and wrenches and other simple tools to complete the installation. This simplify the traditional installation procedure, we will manage to preassemble the screws and nuts before shipment to reduce on-site installation procedures and labor intensity. Eliminate the differences in degree of on-site professional installation and degree of impact on the quality of the roof support system. 3.Utilization of the anodized aluminum, stainless steel, anti-aging UV process to ensure the longer life span of our solar technology and solar tracking. Ground Solar Panel Mounting is suitable for flat roofs of various structures or for the ground. One end of the cross-beam is connected firmly with the ground structure by base bracket and hex-bolts and the another end is connected to the support leg forming a stable and strong tripod structure. The connecting foot is made up of stainless steel to enhance the load bearing capacity. Stainless steel itself has a good physical and chemical mechanical performance, service life can reach more than 30 years. Pole system is designed for up to 1.5kw panel mounting system, with the wind load up to 200km/h. 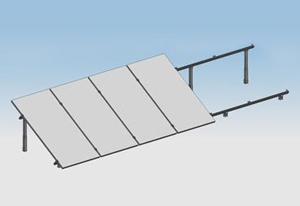 This panel mounting system is suited for large photovoltaic system installation in all wind zones. This solar mounting system can adjust the tilt angle according to the requirement of the installation place. There is no need to welding in the complete installation process. According to our manual instruction, you can install the solar modules easily, quickly, securely and cost efficiently. 1. Convenient and quick installation. The use of bolted connections eliminates drilling and welding process automatically reducing the operating time. 2. Mounting rack structure uses hot dip galvanized steel parts which gives a good external appearance(silvery white) and also has good corrosion resistance.Under natural conditions, it can be used for 20-30 years. 3. Batteries components are made up of aluminum alloy treated with anode oxidation process which makes the appearance of smooth and bright. Since this material is same as panel frame, it can decrease metal corrosion phenomena mutually. 4 Holding component( bolts ,screws) are made of stainless steel bolts, stainless steel itself has a good physical and chemical mechanical properties, its service life span can reach more than 30 years. Please, send us more information about your three types of mounting systems, including the certificates, warranties data sheets for Europe. Please, could you also give us the current price list 2012 and your terms and conditions. dear M.Kawohl, usually solar mounting is customer-made product.we have not price list. you have better send us the solar panel size or Customer-made size,our sale will send a offer to you.